Armani/Dolci offers a broad range of delicious and unexpected flavours, all presented in a refined packaging that pays homage to the Maison’s approach to design. Limited edition collections mark the most important occasions, such as Christmas, Valentine's Day, Spring and Ramadan. The special collections are joined by an exclusive fall/winter limited edition inspired by the fabrics used on the Giorgio Armani catwalks. 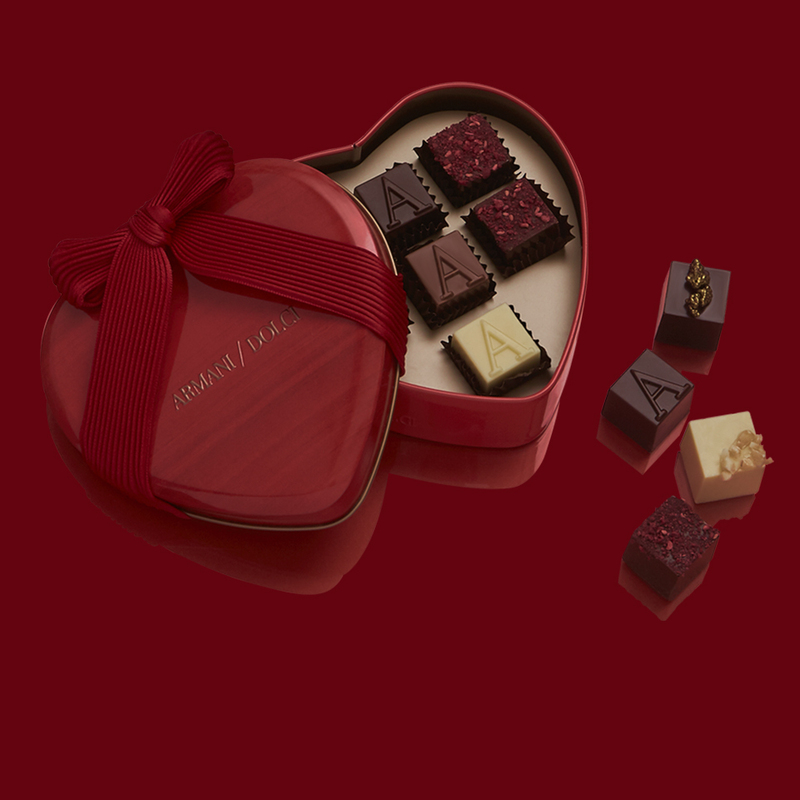 Armani/Dolci is celebrating Valentine’s Day 2019 with a special collection and a new, refined praline coated in dark chocolate, topped with crispy raspberry pieces and filled with coconut cream. The treats are presented in romantic bright red packaging with a marble-effect print. This autumn Armani/Dolci presents a unique selection of chocolates in specially-created packaging, inspired by the colours and prints of the Giorgio Armani autumn/winter 2018/19 womenswear collection. The chocolates come in three different flavours: 75% extra dark chocolate and blueberry aroma decorated in blue; 56% dark chocolate with saffron filling and mandarin aroma decorated in yellow; 56% dark chocolate with earl grey flavoured filling and raspberry aroma decorated in pink. 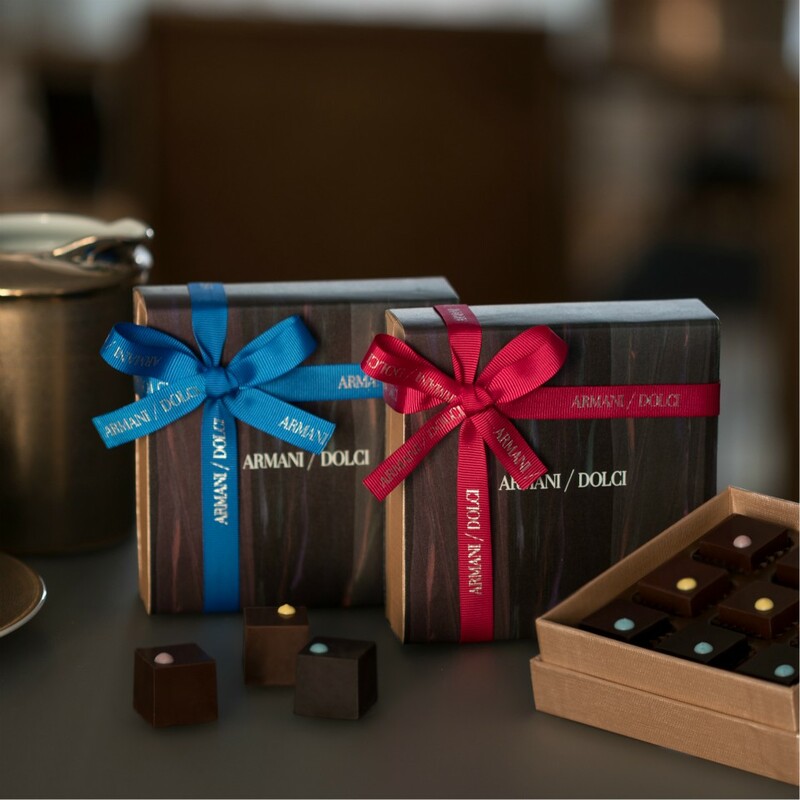 The boxes of nine pralines are wrapped in stylish multi-coloured paper and tied with a two-tone grosgrain ribbon with the Armani/Dolci logo in contrasting silver. To celebrate this holiday season, Armani/Dolci offers a taste of authentic flavours, created with refined craftsmanship and unique raw materials for this special collection. 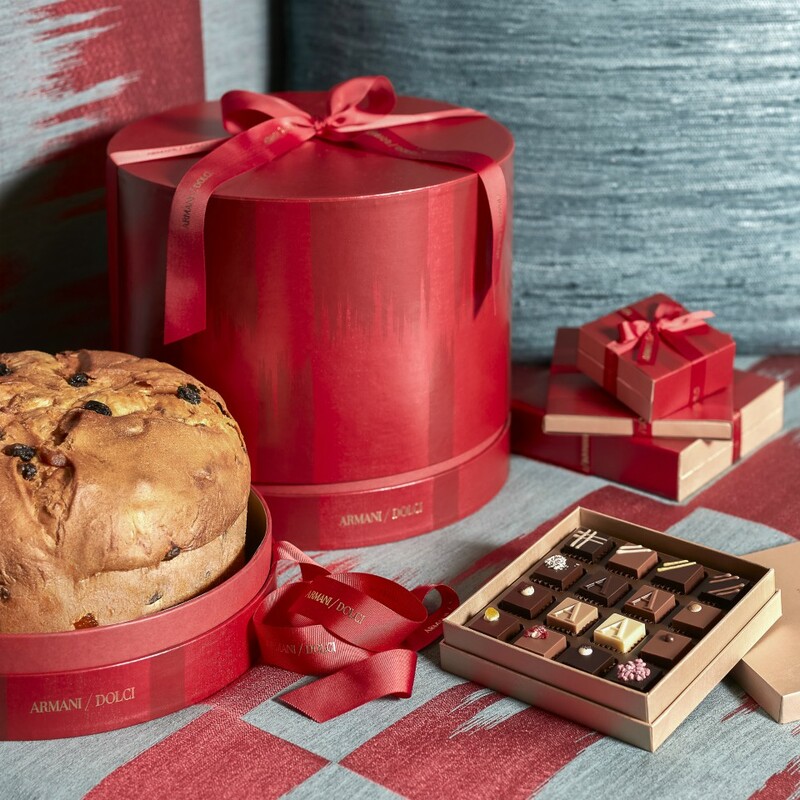 Bright red paper with metallic tone-on-tone highlights envelops the panettone and pandoro elegant gift boxes, as well as the boxes of pralines, chocolate squares, dragées and marron glacé, creating a refined combination of shades of red. A grosgrain ribbon with the Armani/Dolci logo in gold completes the packaging. The panettone is also available in a pear and chocolate version, both in the classic 1kg size and the smaller 100g option, presented in a small tin box. Armani/Dolci brings a touch of elegance, magic and natural sophistication to this Spring season. Just like the Giorgio Armani 2018 Spring/Summer Runway Show, the Armani/Dolci collection is embellished by a hypnotic palette of blue and purple hues, with touches of white, greige and red. A woven pouch, closed with a silver cord, envelops the iconic 16 praline box and the small chocolate eggs. 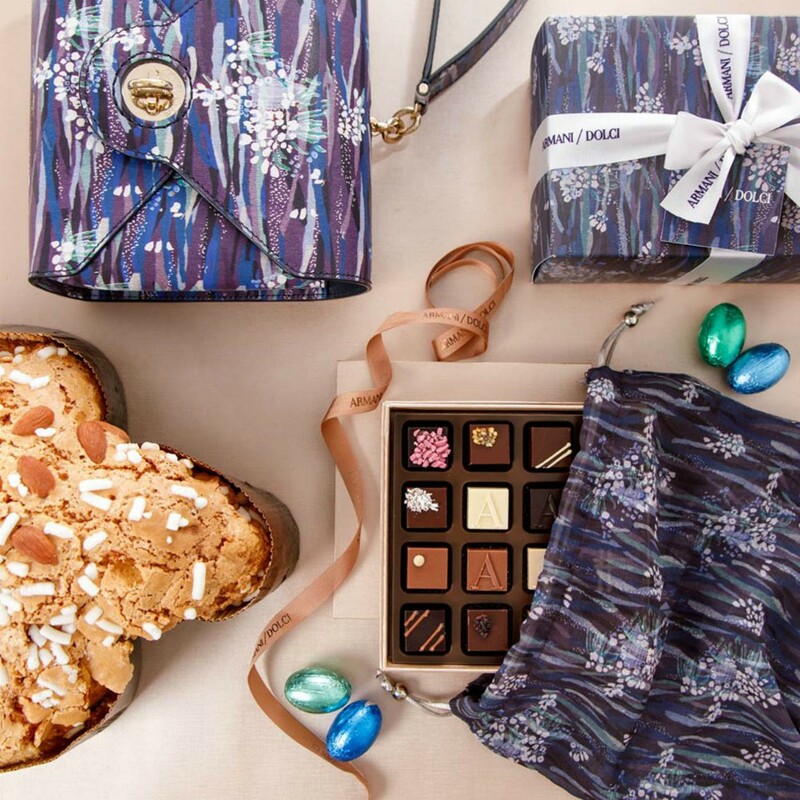 A printed case, trimmed with a branded grosgrain ribbon, incases the most coveted Easter sweets: Colomba cake and Easter Egg. The soft Colomba cake, made with premium quality ingredients, according to Italian traditional recipe, is available in 100g and 1Kg versions. 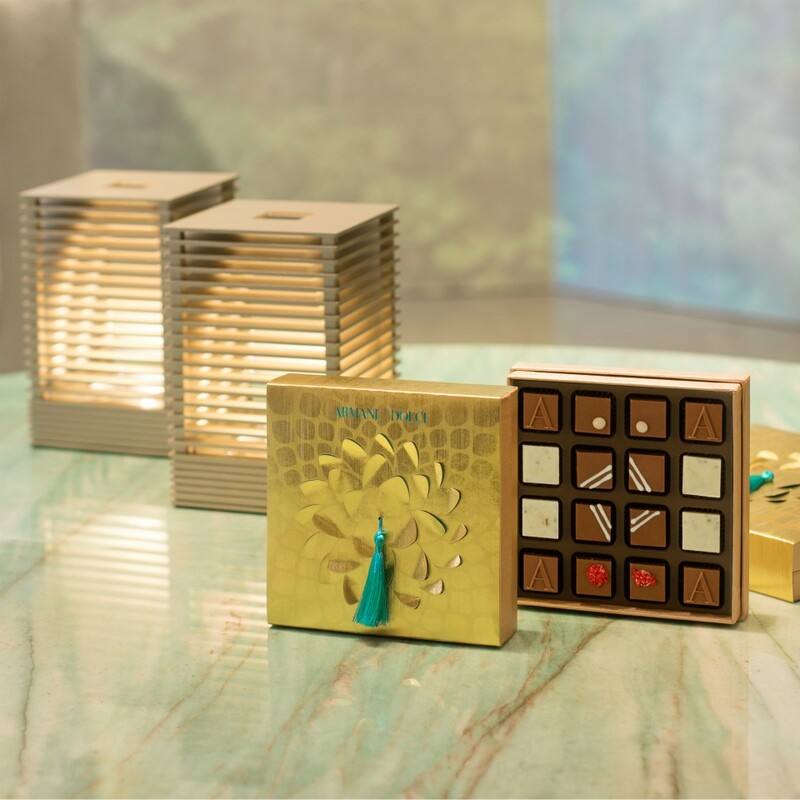 This year, for the celebration of Ramadan, Armani/Dolci has created a limited edition collection inspired by the colours and flavours of the Arab world. The sophisticated packaging is made from gold-coloured paper with an embossed effect in the shape of a pistachio flower, a plant native to the Middle East. The tassel and hot-pressed logo, both in contrasting emerald green, complete the design. The delicate praline, created especially for Ramadan, is made from white chocolate with salted dry fruit and a subtle hint of pistachio. Strictly alcohol-free, the chocolates are available in boxes of 16, 36 or 64, along with a selection of classic pralines featuring an embossed letter ‘A’ and filled with various flavours.